When we are ‘at-one-ment’, when we trust inside and out, when we follow illogical algorithms of faith, our lives become straighter and less complex. Last Shabbat, our Spiritual Leader, Ken Hailpern, gave an inspired d’var Torah about how so many of our Jewish values of caring for others and taking responsibility come from the earliest chapters of Beresheit (Genesis). 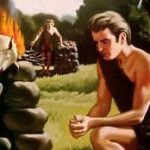 We heard how God brought words of comfort to Cayin (Cain) whose face fell after seeing how his brother Hevel’s (Abel’s) sacrifice was accepted, but not his own. And we heard how Cayin replied to God, “am I my brother’s keeper?” when God asked Cayin where his brother Hevel was. I will return to these sacred moments later. Today’s parasha (weekly Torah reading), about Noach (Noah) and the Flood, apparently was an inspiration for Ken. He asked me to explore the Biblical Flood story in the contexts of recent worldwide natural flood and hurricane events, and with my participation as a volunteer American Red Cross Disaster Spiritual Care Chaplain, assisting with evacuees in southeast Texas. just as they were about to sing the “Arky-Arky” song. Anyone know it? (🎶 Noah, he built him, he built him an Arky-Arky [repeat]🎶). I wasn’t sure who this Noah fella was, but the song was great! This fabulous song was followed by a discussion about who or what God was--did he sit on a throne in the sky? was he old? did he have a long white beard? or was God invisible and wise? I was hooked on Judaism from that day onward. In 2010, after decades of volunteer and lay leadership in the Jewish communities of Vancouver, BC, I decided to begin the arduous path of training to become a spiritual care chaplain. It took about 5 years of full time study and I am now an NAJC Professional Jewish Chaplain. 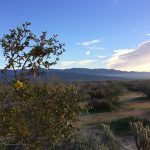 I moved to the Southern California desert this past May, not to take a job; but to enjoy better health in a serene and protected desert locale. And then, just as I was unpacking and wondering what I might want to do in my new community, hurricane season came to the United States. In response, my professional chaplaincy associations sent out emails for those who wished to fast track to join the American Red Cross for deployment. 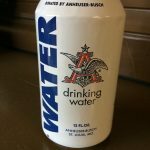 I did not have to think much about going, except--that this deployment would not be restful, and it could cause me some health problems from exposure to contaminated water and lack of good sanitation. I responded to the email anyway, went to my regional American Red Cross (ARC) Head Quarters, and after an introductory ‘boot camp’, I was sold. I had responded online on Friday, and was in Houston four days later, on Tuesday September 5th. 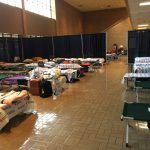 I had the privilege of meeting the National director of Disaster Spiritual Care (DSC) at Houston HQ, and with his approval, was assigned the George R. Brown Convention Center mega shelter, which now housed 1,200 evacuees, down from 5,000 at one point. 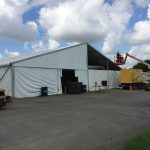 The second day there, just as I was settling into getting to recognize residents’ faces and enjoy the company of newfound colleagues from other faith groups, I was told to join two others and drive to Beaumont-Port Arthur, Texas. There were as yet no DSC chaplains at all, and the 3 of us would attend to shelter work for that entire region. 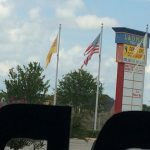 We each had our own rental vehicle because unlike anyone else, the three of us were to cover the entire southeast Texas area. We were housed in a staff shelter with 200 other volunteers, on cots, with freezing A/C blasting to keep germs at bay, and no potable water to bathe in or drink. Over the usual breakfast of sugary granola bars and fruit cups and potato chips, we decided to split up and drive to different areas of the region to see where the greatest need was. I settled on ministering in just one shelter—the Thomas Jefferson High School in Port Arthur, TX—“TJ”. Port Arthur is one of the poorest areas of southeast Texas, and the US in general. These people were now in their 3rd or 4th shelter, with all of their belongings stuffed into old bags or plastic storage bins beneath their cots. I use the word ‘minister’; it is not a Christian word, it is noun and also a verb that is used in many contexts. For example, I lived in Canada for almost 40 years and there we have Ministers in our Provincial and Federal houses of government. Ministers administer services to people, both secular and faith-based. The work is ministry. I had little trouble easing into ministry in Port Arthur. The residents, evacuees, were predominantly black, very low income, and often with health problems. Anyone affluent had already found alternative housing somewhere else, with a relative, friends, etc. These remaining 250 or so people at TJ were looking for places to live, and were waiting for organizations such as FEMA to assess their homes for damage and give them funds to repair or rebuild. Perhaps because of my life experiences as a cultural ‘outsider’, a single, middle-aged Jewish woman, living in predominately white Christian communities, and receiving chaplaincy training mainly with Christian peers--I was able communicate my otherness, go alongside others whose lives are not mainstream, earn trust, and be with them in their search for spiritual comfort. I mainly roamed the vast rows of cots filling the two gyms at TJ, checking in with my eyes and ears and ‘Spidey Sense’ with residents. I was their advocate when needed services were not being given, a guide and motivator when the chips were down, prayed with and for them, held their hand if waiting for the ambulance, comforted and debriefed when traumatic incidents happened, ran interference when tempers flared, got crabby volunteers to loosen up, and made referrals to my colleagues in Disaster Mental Health and Disaster Medical Assistance Teams. I also made sure kenneled pets were watered and fed, cleaned up childrens’ toys, and played maid and waiter to pamper burned-out parents. When I arrived at TJ, the residents had already been there 10 days, and found their spiritual leaders—amongst themselves--an assistant minister and his wife; the maintenance man for the school itself was a church pastor. 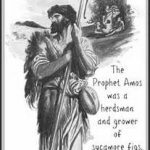 I thought about other Bible characters, such as Amos and Elijah. The example of the spiritual leader who is a regular person, someone who tends orchards, plows their own fields, and cleans schools for a living. We don’t know what Noach did for a living, but we do know that he was by nature righteous, and someone who walked with God; perhaps strolling together in conversation, as one would do with an earthly companion. Instead, almost everyone I sat with talked about Faith. They had Faith that there would be relief. They had faith that despite the disaster, God was walking with them, and watching and taking care during this disaster. They often had anecdotes of previous hurricanes or floods they'd evacuated from, and how by trusting God and accepting the help that God had sent, that they had been taken care of then, and were certainly being helped now. I think we Jews don’t talk enough about Faith like this. Much like the term ‘Minister’, Faith is seen as a Christian concept. In Judaism, we talk more about ‘Mitzvoth’ and Actions. But I want to tell you that Faith and Mitzvoth are the same thing. As an example, it is a mitzvah to keep kosher. Many of the rules of kashrut do not make logical sense. But observant people do them anyway. Why? because it is an act of faith. Faith works in that we do not have to understand why, that by being consistent and having these structures of precise foods or ways of blessing them, we will grow inner, rather than outer, strength, grow stronger as individuals and as a people, and thus know God better. In this same vein, the people of Port Arthur knew how to recognize God’s faith in them. 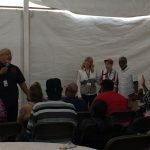 They could graciously accept help because they knew they could not get by on their own--and that God was at work when neighbors helped neighbors, rescue operations came, shelters went up, and agencies came to assist. They knew how to reach out to one another because their Christian teachings told them that that is the right thing to do; people from all over the world reached out to help. It was a privilege that after only 3 days with them, the two TJ preachers asked me to co-lead a Sunday morning service. Having had the privilege of attending black gospel churches in Harlem and Brooklyn during my chaplaincy education, I was so very pleased to join them. On Sunday, alongside a mighty preacher with his golden baritone voice, this man motivated by personal loss, by the flooded homes, and the pain and longing in that shelter; and alongside the assistant minister lovingly reading Psalm 27; I gave prayers of thanks to God for spreading his sheltering wings; and encouraging all to reach out to give help; and to reach out to accept help; and all of us came together in song to close. These men and women of faith have become life-long friends. We led another service together the following Sunday in yet another shelter, which these 250 residents had been transferred into. As a chaplain, I have learned to accept my clients’ choices. I stay out of their way because I have faith in them. Sometimes, by seeing my non-judgmental faith in them, they find restored faith in themselves or with God. In parashat Noach, although the story of a destructive Flood outwardly seems so apropos to my situation, it was really the character of Noach and the instructions that God gave for building the Ark that characterized what I experienced amongst the evacuees. Religion is not mentioned in the Noach story. God tells his walking partner, Noach, a man that stood out amongst others, that humans and all life have made a mess of things, and that he will destroy all of it but save a few good seeds, and start fresh. And in Gen 6:14 what does God tell Noach to line this protective ark with, to keep it watertight and safe, inside and out? כפר pitch. The same root letters as kippur, as in atonement. We are then walking with God. Far from being a punishment, many of the shelter residents expressed their belief that the hurricane was a blessing because it caused so many lives to be repaired. Indeed, family members who had been estranged were now reaching out to each other to provide homes and assistance; people who had been isolated before were now flourishing by finding meaningful helping roles; people were returning to church; having lost excess baggage, many were now finding blessings and gratitude for small things. 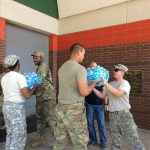 In this hurricane flood Ark/shelter, they were finding at-one-ment. Ken, you picked a great Shabbat for this d’rasha; I feel that my life has come full circle: my childhood affinity for Judaism and Jewish ways that began with the “Arky-Arky” song became manifest in the most unlikely of environments, and I thank you for allowing me this opportunity to both share the stories of the people of Beaumont Port Arthur, and to create a deeper understanding of the stories of Beresheit. It was a privilege for me to know these people. I was fortunate to have a role where I could freely do my job. No one told me how to offer DSC to these people; we were deployed because we were seen to have the expertise to be self-directed and create an ark of at-one-ment for the people of Port Arthur. I saw faith enacted, and it gives me comfort to see how powerful faith; in God, in one another, and in oneself, can be. Sharing a shelter coffee with a stranger who calls their temporary cot 'home' may just be the best cuppa joe you've ever enjoyed. I am writing from the deck of a cruise ship after having spent two weeks on deployment as a Red Cross Disaster Spiritual Care Chaplain in Texas. 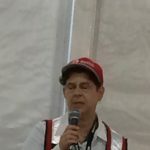 Currently, I am the cruise ship's rabbi and chaplain for the Jewish High Holidays; however for the weeks of September 5-19, I was deployed by the American Red Cross (ARC) in the role of DSC or Disaster Spiritual Care to provide assistance after Hurricane Harvey. Let me show you what I learned about the difference between First World versus Real World problems, and spiritual distress. 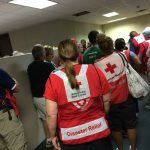 My deployment to Texas occurred within 72 hours of signing up with the Red Cross Volunteer Connection site. It would have left sooner but I took a day to pack and find neighbors to mind my new home in the Southern California desert area. As a hospital chaplain with 6 Units of Clinical Pastoral Education (CPE), I was fast-tracked into service. My flight arrived in Houston, TX around 9pm. My cellphone immediately rang with instructions to pick up a rental car and drive to a staff shelter in a church near downtown Houston: I had been binge-watching the original 'Mission Impossible ' episodes for the past few weeks; now I was living them! In brief, I did not sleep that first night in Houston. On a bare Red Cross cot with not enough blankets to keep warm, I began my 2-week saga of life with ARC Disaster Relief. Breakfast was granola bars and coffee and I received yet more instructions by text to go to Houston HQ. I met the lead of DSC operations there and received my first briefing interview. My placement was to be at the Houston George Brown Convention Center (GBR), where refugees had numbered over 3,500. Now the Red Cross was downsizing to 1,200 residents, hoping the city of Houston would soon accommodate the remaining evacuees. While at the GBR I ministered to people of all faiths, mostly helping residents locate the right services for their needs: FEMA, food stamps, reunification services, meals. 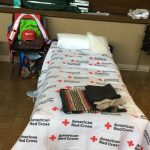 I was approached by news media who asked me to provide a resident who could tell their story of being homeless and how the Red Cross would help them find housing. I hesitated to do this, as my profession's ethics require confidentiality with clients. "We don't wish to exploit anyone" the media rep said. I claimed inability to provide such a resource for the news media. My primary duty was to aid survivors and ease their distress. After two days at the GBR, I was transferred to Beaumont-Port Arthur, TX, where I spent the remainder of my deployment. I was assigned a cot at a new location in downtown Beaumont, and there remained for a few days. Like all of Beaumont we had to rely upon bottled water, as tap water was not potable; shower at your own risk. Let me tell you about southeast Texas. The community of Port Arthur is amongst the poorest in Texas, and certainly under-served with regard to receiving enough public support services. I know this from first-hand experience, not through news media or social media sources. This made my role of DSC chaplain stretch from immediate bedside spiritual care, to spiritual care in the form of community advocate as well. Chaplains do more than provide religious, prayer, grief recovery or comfort services. We are also watchdogs and advocates for our clients. Just as I might have watched the nightly news and felt driven to speak for and advocate for relief and services to the people of Port Arthur, I was grateful to have the opportunity to roll up my sleeves and become an advocate in person. I was at cot-side all day with individuals, and also made reports to any and all support providers to ramp up their services; both emergency and medical aid, mental health support and interventions, insuring clients were on lists with real appointments for financial, food, and insurance claims. I also played the role of 'loyal opposition'; working within the care system, while taking risks by speaking up with administrators about shortfalls in services from government agencies, medical services, placement and reunification services, and housing programs. 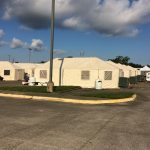 Although life was harsh in the shelters, with hundreds of citizens lying in close quarters on cots, it reflected what I observed as an acceptance for poor conditions as the norm for Port Arthur denizens. However, I am not able to share any photos online that may show evacuee-guests in them due to confidentiality concerns. The Port Arthur shelters were created in the gymnasia of a high school. 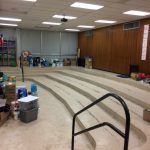 Here is a photo of the theater in the music department; it is indicative of the paucity of funding for core arts programs that might inspire and elevate the aspirations of students in Port Arthur. How would you feel if this were the music theater for your child's school? My role officially was not to change what was before the hurricane. But I can show you and ask: What can you do to correct this disparity in educational facilities and funding? Everything that creates a community evolves from its educational system, which ultimately contributes to the wellbeing and welfare of our nation. Next, direct spiritual care. Yes, I am Jewish, and no, very few in south Texas who were affected by the hurricane were. I want to commend the local Beaumont Jewish community for reaching out beyond its own membership to the community at large and distributing items it collected to provide for survivors' basic needs and beyond. One member even did my laundry for me! The Red Cross encouraged faith communities to join them as a partner in disaster. Creating a system of ongoing local community-based aid, such as the Jewish and other groups did, will enable longterm local aid, so vital to self-determination and neighborly outreach. Now, if you are wondering why this essay title says "First World Problems", here comes the answer: whatever troubles are turning your crank, e.g. disappointment with your Internet provider, or with a recent dining experience, or with bad office politics, perhaps this essay about life in Port Arthur can reset your perspective. If you are looking for ways to actualize your concerns or find your voice beyond what you can post to FaceBook, then consider signing up to volunteer or work in disaster relief. You will see the difference between what we in our comfortable First World privilege expect, versus what the reality is. And best of all, you can take your awesome advocacy skills and apply them first-hand toward fixing world problems. Not all of North America and Europe are living in First World Comfort. Yes, you can do something. Volunteer, donate, organize, remember, comfort.